As dog lovers, we know how a dog can comfort, energize, motivate and bring joy. Therapy dogs take those good qualities and spread them around. 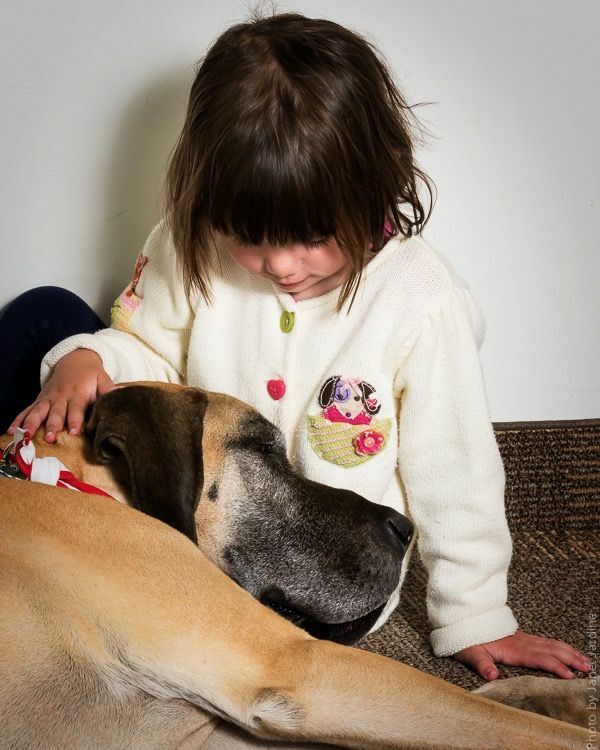 One of Baxter’s friends, Leto the Great Dane, is a therapy dog. 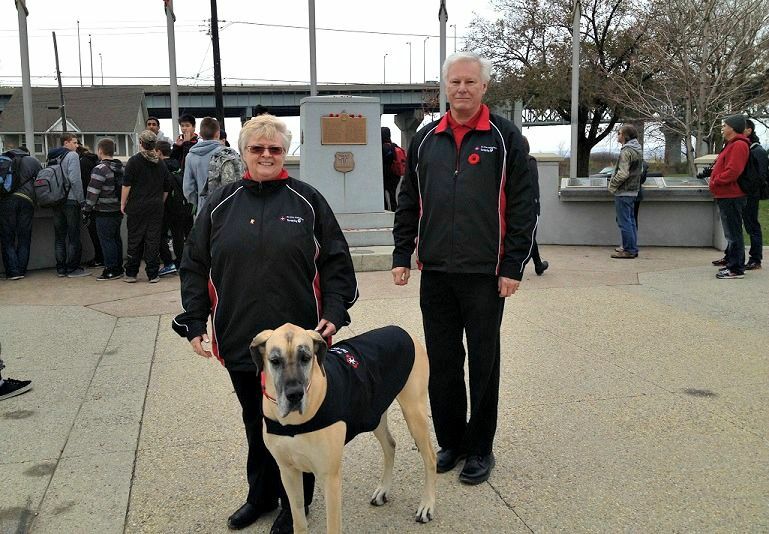 In fact, her owner, Cory Huston, coordinates the St. John Ambulance therapy dog program in Burlington, Ontario. I recently sat down with Cory to ask about her experience in the program. While St. John Ambulance operates all around the world, its only therapy dog program is in Canada. Therapy dogs with St. John are active in nursing homes, group homes, schools, libraries and even hospitals (in some areas). 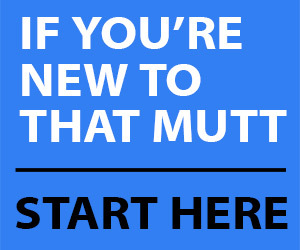 People join because they want to give back to their community and share the joy of their dog with others. People self-identify as volunteers. Cory and her team evaluate the dogs before admitting them to the program. Visits can happen one-on-one or in groups. In retirement homes, volunteers may gather in a common room and allow residents to meet and pet the dogs. In nursing homes, they may be assigned particular rooms and patients to visit. Most shifts are about an hour, and volunteers try to see as many people as possible during that time. Shifts are available in the evening or during the day, depending on volunteers’ schedules. Little dogs are particularly suited for people who are in bed or in wheelchairs, as they can sit in people’s laps. Leto, who is a Great Dane, is tall enough for a person in bed to easily pet her. 80% of dogs in the St. John program work in retirement or nursing homes. After a special evaluation, dogs also do sessions in schools and libraries, visiting with classes or helping children with reading. In Paws for Stories, dogs lay on the floor beside children, who then read a story to the dog to help them build confidence in reading. Safety is the first concern in the program. Volunteers are not allowed to move patients in case of falls. Dogs have to stay on leash and the handler has to hold the leash at all times. “Most of the time I prefer that people don’t do tricks with the dogs. Old people’s skin is so fragile, and just doing high fives can scratch them,” says Cory. The type of therapy depends on the dog. For example, Leto thrives more with children, as opposed to retirement and nursing homes. Dogs have to be well socialized, so that they are comfortable with other dogs, people, noises and situations. Dogs also have to be up-to-date on their vaccinations and in general good health. Therapy dogs should be very self-confident, calm and want to visit with people. Likewise, the handler has to be calm, personable, friendly and like people. As well, it’s important that handlers respect the rules of their therapy dog organization and be committed to completing their volunteer shifts—St. John asks for one hour a week from its volunteers. Even with the most social of dogs, therapy sessions can be tiring. Leto works for about an hour and a half at a time. “Longer than that and she’ll turn her back on people or go lay down under a table. She won’t interact with people anymore,” says Jeremy. For a therapy session to work, your dog must be having fun. Pay attention to your dog and know her limits. As rewarding as it is to be a therapy dog, sometimes volunteers encounter challenging situations. With people who have dementia or autism, some days they love your dog, and the next day they don’t. People may yell or cry. “You have to be really careful how your dog reacts when somebody’s crying because some dogs just really hate it and get upset and just come over to you and cower. Other dogs want to go over and say what’s going on and depending on the reason for the kid crying that may not be the best situation,” says Cory. Some people have little impulse control and may react physically—one child once punched Leto. Most of the time, staff at the facility will advise the handlers if they’re going into a challenging situation and will often accompany the volunteers and the dogs. Therapy dogs provide numerous benefits for people they encounter. 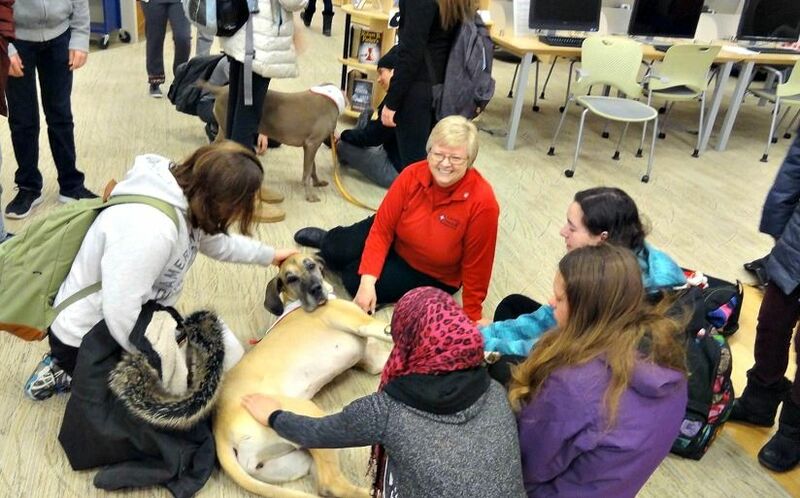 For staff and teachers, therapy dogs can help them deal with the stress of their jobs. For patients and children, its a fun, calming activity during their days. And for the volunteers, the appreciation they receive and happiness they bring keeps them committed to the program. Cory tells the story of being at a nursing home and seeing an elderly gentleman sitting in a chair. The man’s daughter came over and asked if they could bring the dog to visit with her dad. So they took the dog over. The man was just sitting there and then all of the sudden he started to pet the dog and then started talking to the dog. The daughter burst into tears and explained her dad hadn’t spoken in three months. Not a single word. Have you considered training your dog for therapy work? Do you know any therapy dogs? St. John Ambulance therapy dog program started in Canada in 1992 and today more than 3,300 therapy dog teams give more than 230,000 hours of their time each year bringing joy and comfort to the sick, lonely and those who need a friendly visit. Julia Thomson is a regular writer for That Mutt. Visit her blog Home on 129 Acres where she writes about her adventures of country living and DIY renovating. Ace has a good friend named Buddy (golden retriever) who is a therapy dog. He is so relaxed and gentle and lets kids read to him and pet him. We love knowing how Buddy is making a difference for kids every week. Buddy has such a calming energy about him. He helps make everyone around him more comfortable whether it’s kids, adults or dogs. Such a good boy. Leto sounds like she has a gift as well. I did email a local group about how to get involved with Ace as a therapy dog. I don’t know if we’ll actually do it or not but I’m curious. I hope this post inspires others to consider getting involved as well. It sounds like Ace is a pretty even-tempered easy-going guy, so I can see him being able to handle the unusual situations that arise in therapy sessions. I’m glad to hear that you started to investigate volunteering. Even that is a great step. I recently applied for my border terrier to become a therapy dog here in Ireland and actually got accepted. But the time commitment was something I just couldn’t stick to. They highlighted how important these hours with the dogs are and I felt I couldn’t stay committed every single week at the same time. So I very reluctantly declined. Its something I would love to do and would definitely consider it again in the future when I have a bit more time on my hands. Its such a fantastic idea and I do hope more people get involved! Congratulations on being accepted. I think it’s great that you were realistic about what your could commit to and didn’t enroll and then bail. Hopefully you’re able to come back to it in the future. Hi my dog is a german shepherd called Kaz.I joined Pets As Therepy.I took Kaz to my work place a medium secure psychiatric hospital. The response was amazing.I developed this so that they did agility with Kaz and went on dog walks in the community.Their self esteem and social interactions improve considerably.I now take her to new unit and am developing the service there.I do not know who benefits the most the patients myself or Kaz. absolutely joyful. i wanted to train my girls to be therapy dogs. my dog breeder is a certified therapy teacher and trainer. all of her dogs, the show dogs are therapy dogs. she goes several times a week, plus teaches weekly classes. my oldest was not certified but she would go to the assistant living facility with me to visit my mother and she would stop and visit with all of the other residents along the way. That’s nice that you’re able to bring her to visit your mom and other residents, even if it’s unofficial. I’m sure you’re still bringing a lot of joy to the people you meet.